Some of the paintings you see above were painted by some of the most renowned artists in human history. The others were made by an artificial intelligence. Robotic brains have a ways to go before they match the masters in terms of pure creativity, but it seems they’ve gotten quite good at mimicking and remixing what they see. 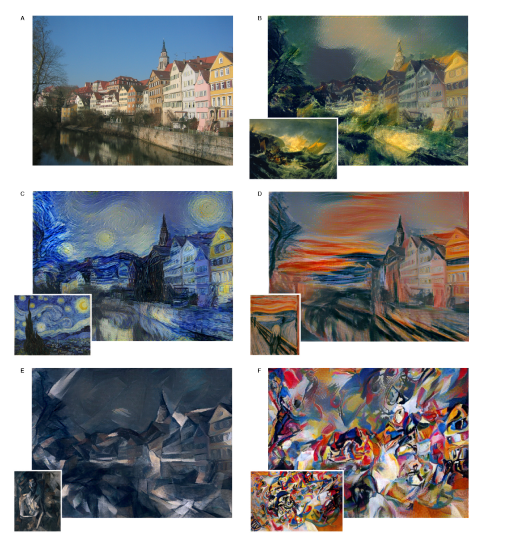 In a study published late last week by researchers from the University of Tubingen in Germany, researchers described an artificial intelligence neural network capable of lifting the “style” of an image and using that style to copy another image, which is why you see these waterfront houses look as though they were painted by Picasso, van Gogh, or Munch. As you might expect, the math is quite complex, but the basic idea is pretty simple. As the researchers explain, computers are getting very good at image recognition and reproduction. The neural network basically does two jobs, then: One layer analyzes the content of an image, while another analyzes its texture, or style. These functions can also be split to work across two images. Georgia Institute of Technology researchers have developed a new artificially intelligent system that crowdsources plots for interactive stories, which are popular in video games and let players choose different branching story options. A new Georgia Tech artificial intelligence system develops interactive stories through crowdsourced data for more robust fiction. Here, the AI replicates a typical first date to the movies (user choices are in red), complete with loud theater talkers and the arm-over-shoulder movie move. With potentially limitless crowdsourced plot points, the system could allow for more creative stories and an easier method for interactive narrative generation. Current AI models for games have a limited number of scenarios, no matter what a player chooses. They depend on a dataset already programmed into a model by experts. Using the Georgia Tech approach, one might imagine a Star Wars game using online fan fiction to let the AI system generate countless paths for a player to take. “Our open interactive narrative system learns genre models from crowdsourced example stories so that the player can perform different actions and still receive a coherent story experience,” says Mark Riedl, lead investigator and associate professor of interactive computing at Georgia Tech. IBM is testing a new way to alleviate Beijing’s choking air pollution with the help of artificial intelligence. The Chinese capital, like many other cities across the country, is surrounded by factories, many fueled by coal, that emit harmful particulates. 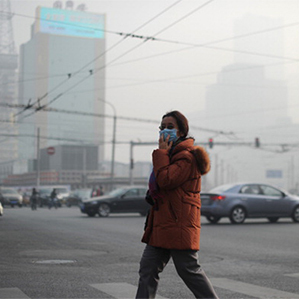 But pollution levels can vary depending on factors such as industrial activity, traffic congestion, and weather conditions. The IBM researchers are testing a computer system capable of learning to predict the severity of air pollution in different parts of the city several days in advance by combining large quantities of data from several different models—an extremely complex computational challenge. The system could eventually offer specific recommendations on how to reduce pollution to an acceptable level—for example, by closing certain factories or temporarily restricting the number of drivers on the road. A comparable system is also being developed for a city in the Hebei province, a badly affected area in the north of the country. The Air Force Wants You to Trust Robots–Should You? A British fighter jet was returning to its base in Kuwait after a mission on the third day of the 2003 Iraq War when a U.S. anti-missile system spotted it, identified it as an enemy missile, and fired. The two men in the plane were both killed. A week and a half later, the same system—the vaunted Patriot—made the same mistake. This time, it was an American plane downed, and an American pilot killed. The missile battery that targeted the two jets was almost entirely automated. There were people there watching over it, but they deferred to the machine’s analysis, and these friendly fire deaths were the result. A decade later, the issue underlying the problem hasn’t gone away. Indeed, it’s become more pressing as the military comes to rely more and more on automation, and spends huge sums of money researching and developing artificial intelligence. In the future that could include what it calls autonomous weapons systems, one of the most controversial fields of artificial intelligence. Continue reading The Air Force Wants You to Trust Robots–Should You? Posted on 05.09.2015 05.09.2015 Categories ArticlesLeave a comment on The Air Force Wants You to Trust Robots–Should You? IBM Corp. is rolling out two new TV ads during the U.S. Open this week to showcase its cognitive computing system Watson. The spots feature startups that are using the platform to build apps serving industries from healthcare to travel to retail. Watson, which is named after IBM’s founder Thomas J. Watson, was introduced to the public in 2011, when a computer powered with the artificial intelligence technology competed on the “Jeopardy” game show (and won). Last year, IBM formalized a Watson Group business unit — pumping $1 billion into its development — and it promised to set aside $100 million to seed companies that are developing mobile apps with the technology. Toyota is investing $50 million into artificial intelligence research in partnership with MIT and Stanford University. Toyota is getting serious about embedding artificial intelligence in its cars to cut down on accidents. On Friday, the Japanese automaker said it’s partnered with Stanford University and the Massachusetts Institute of Technology to create two joint research centers focused on using technology to make driving safer. Toyota will fork over $50 million over the next five years that will be divided between the two universities to study the use of artificial intelligence. AI is a hot area of computer science related to teaching computers to learn and make decisions like humans can. Dr. Gill Pratt, a former program manager for the Defense Advanced Research Projects Agency, or DARPA, and leader of its well-known robotics competitions, is joining Toyota to oversee its AI research. He will be based in Silicon Valley. “We believe this research will transform the future of mobility, improving safety, reducing traffic congestion, and raising quality of life for everyone,” Kiyotaka Ise, a senior managing officer for Toyota, said Friday.